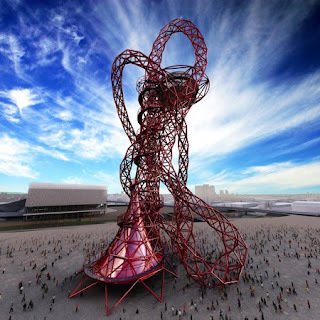 black_tansa_: ArcelorMittal Orbit - Withering Icon of the ‘greenest’ Olympics ever? ArcelorMittal Orbit - Withering Icon of the ‘greenest’ Olympics ever? I’d guess Boris Johnson is twitching in his Foster designed office right now; In less than two years time the world’s eye will turn to London and expect us to eclipse the awe inspiring and iconic images we saw at the Beijing Olympics. 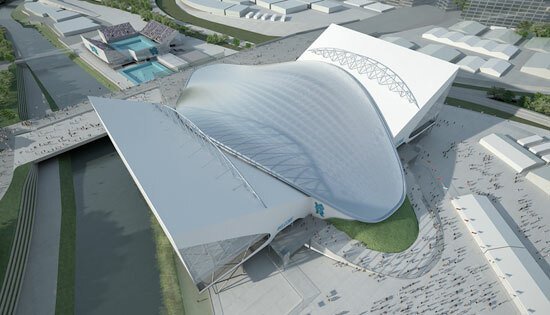 But should we hope to even matching Herzog and De Muerons Birds nest stadium or the water cube, let alone eclipse it? More to the point, why would we try to, if nothing else – this is going to be the ‘greenest’ ever Olympics... isn't it Mr Johnson? The Hadid designed aquatic centre is obviously supposed to be the iconic jewel in our Olympic crown. However with its new found ‘wings’ it is quite obviously neither sculpturally interesting or engineeringly groundbreaking to be ‘iconic’ enough for Boris, it’s essentially a concrete clad steel frame. From a sustainability and legacy point of view, its going to be too big to be fully utilised after the Olympics, yet its too small to fulfil the requirements of the immediate needs without the need for the thoughtless boxes being bolted onto the side? Isn’t the whole skill of architecture about developing a design solution to suit a very specific and sometimes complex fluid brief, as opposed to the search for mindless aesthetics at discord with its contextual and programmatic needs? Never mind Hadidism, postmodernism or iconism, this is mindless shambolism. The Olympics demands more than this mid-way mediocrity. Extravagance is the sad prerequisite of hosting something to be viewed by the world. 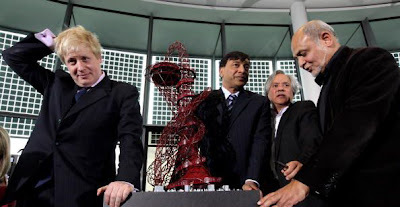 We obviously couldn’t manage extravagantly sustainable - So is it any wonder that good ol’ Boris picked up the phone to his pals Kapoor and Balmond to produce an even more repugnant ‘icon’. The Mittal Orbit is hardly a sculpture, how many sculptures have to meet building regulations? Regardless, it has the aesthetics of a rollercoaster that’s just hosted the Al Qaeda Christmas shindig. It’s certainly no engineering feat either, in fact no matter how hard they have tried to disguise, its been engineered to look like it should fall over, to the point where you know it wont. When you actually want it to. 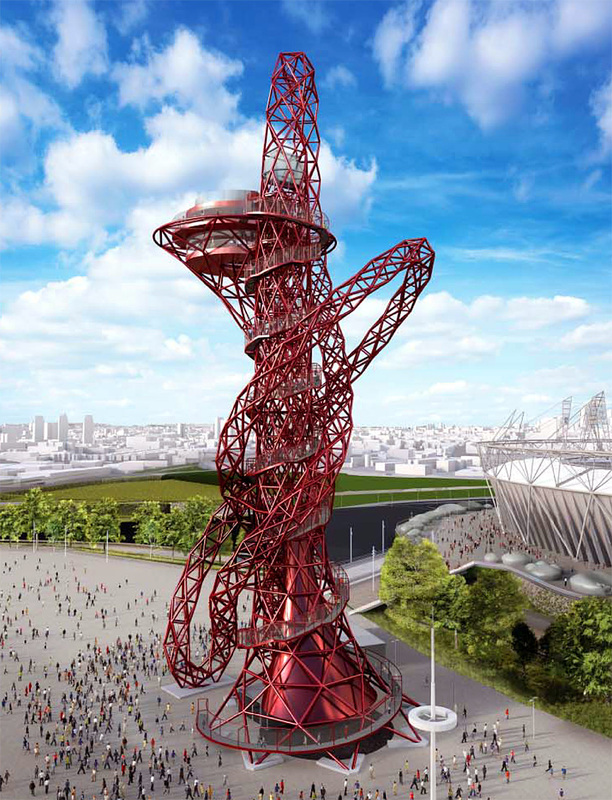 Aesthetics apart, it also sits at such ill ease with the Olympic stadium, like a rusty old fairground ride dumped in its carpark. Where is the consideration? Is there a reason for where its parked? The perfect composition of useless iconic structure and carpark. ﻿﻿Boris, less of the archicrap - We want to know what it does, what it says, what it signifies or what it adds to our Olympics or the supposed legacy its going to leave?! What actually is it that’s even of uk origin? Name, design, funding or materials?...nope, none. It gets better when we move onto its green credentials. Lumping 1500 tonnes of steel from the other side of the world for no apparent reason, if that’s not sustainable enough for you - check the Co2 emissions of Archellor Mittal (the official sponsor, the fact that Boris struck the deal with Mr Mittal in a toilet says it all) – Every year it produces around 220m tonnes of carbon waste – equivalent to the whole output of the Czech Republic or just under half of the UK's total emissions in 2009 - Talk about selling out Mr Johnson. By default Boris, you may well deliver the greenest Olympics ever…but we all know without the iconic crap like this it could have been much much greener.